The firm announced in October the tyre plant, which employs 845 people, would cease production. 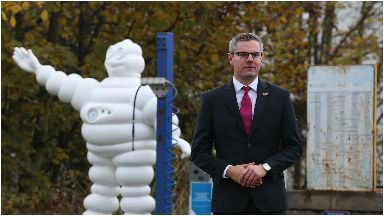 Economy Secretary Derek Mackay has presented Michelin with two proposals to try to save jobs at its closure-threatened factory in Dundee. Michelin announced in October the tyre plant, which employs 845 people, would cease production by mid-2020. The Michelin Dundee Action Group was formed to attempt to protect jobs in the city and Mr Mackay met representatives from the French firm in Edinburgh last week to outline the two alternatives put forward by the group. Mr Mackay said: "I had a productive meeting with Michelin senior executives on Friday where we presented propositions relating to the future of the Michelin site and its workforce in Dundee. "On Friday, I will convene the third meeting of the Michelin Dundee Action Group and update them on the company's response and the next steps." The action group is led by Dundee City Council leader John Alexander and Steve Dunlop, chief executive of Scottish Enterprise, with both Scottish Economy Secretary Derek Mackay and Secretary of State for Scotland David Mundell also involved, as well as John Reid, director of Dundee's Michelin site. Michelin previously said the market for premium smaller tyres, such as those produced at the Tayside plant, has dropped significantly due to an increase in cheap imports from Asia and a shift to larger car tyres.